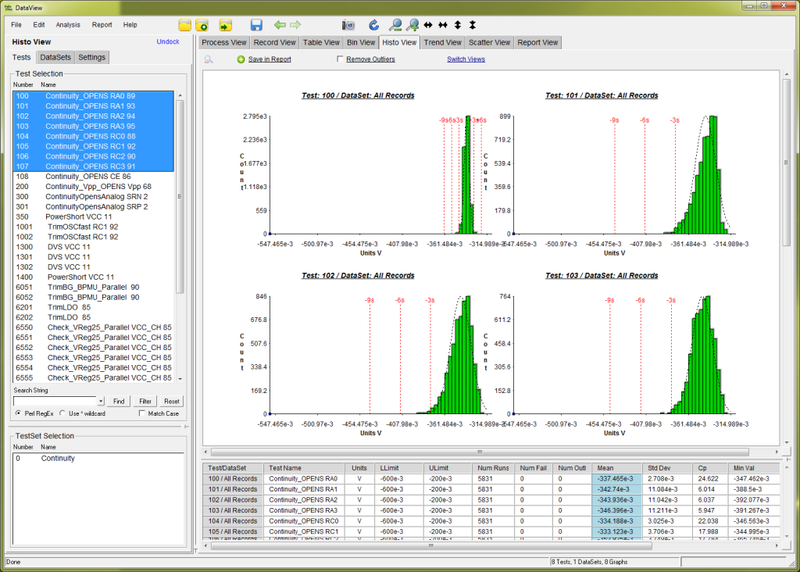 Analyze Limits – Select the tests of interest, the type of analysis, and display formats. The results are presented in TableView. 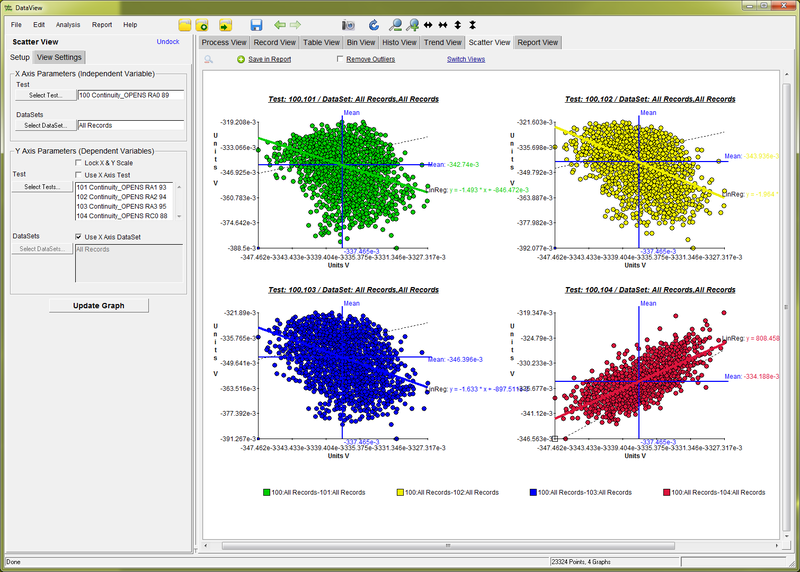 DataSet to DataSet Comparison – Compare statistics for DataSets. 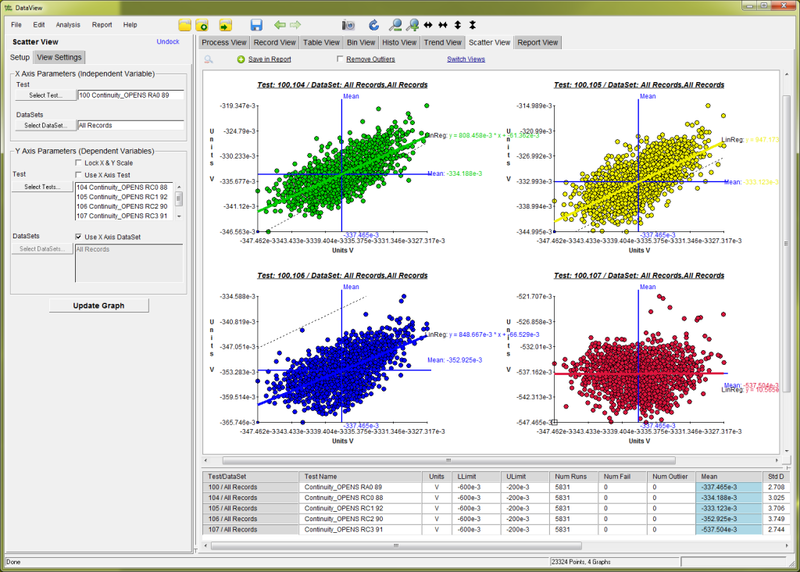 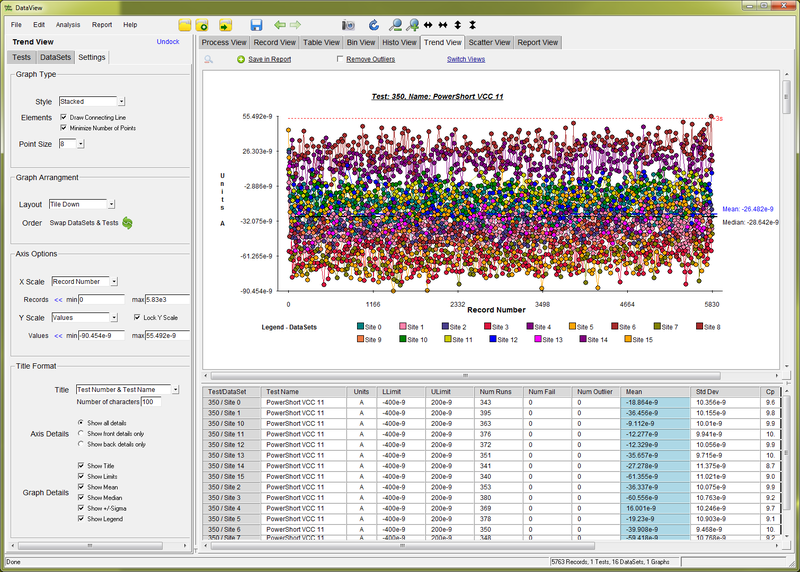 Select the tests of interest, choose the comparison DataSets, set the Analysis Type, and Display properties. 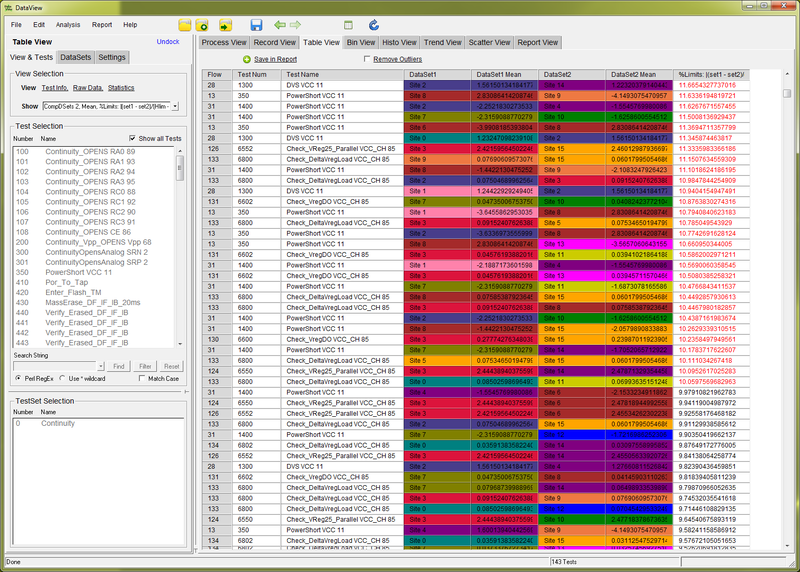 DataSet to DataSet Comparison – Color coded DataSets report showing the Means for each tests and site, compared to every other site DataSets, sorted largest variation to smallest. Bin Paretos – View bin percentages and paretos for Soft Bins, Hard Bins, Failed Tests, and Test Values. 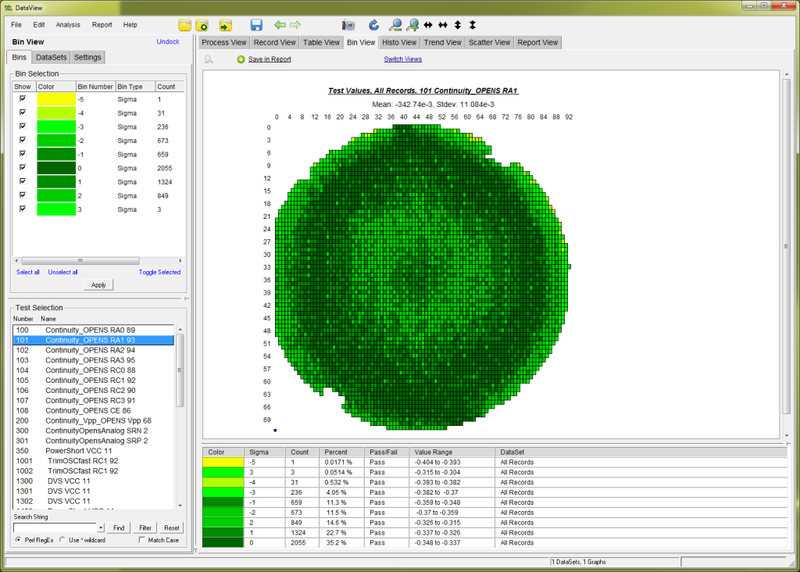 Composite Maps – Stack several wafers and view binning across multiple wafers. 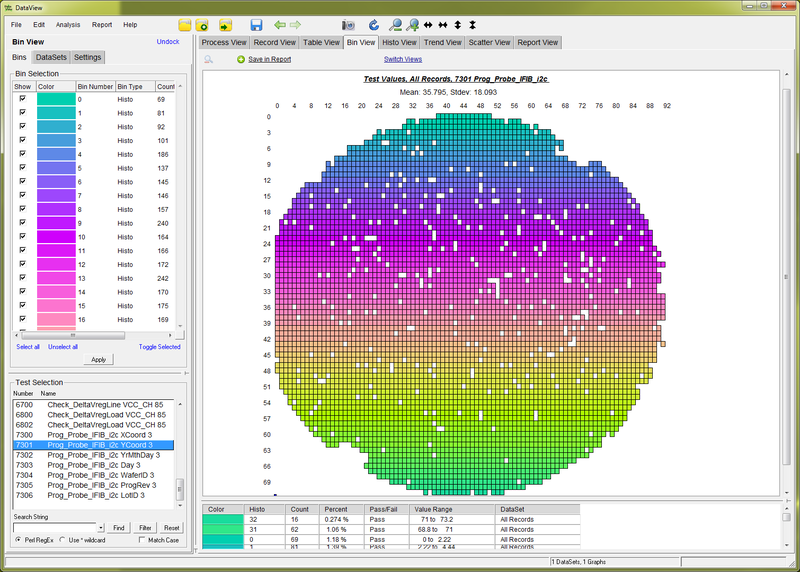 Histogram Heat Map – Visualize histograms across your wafers and lot maps (wafer Y coordsshown). 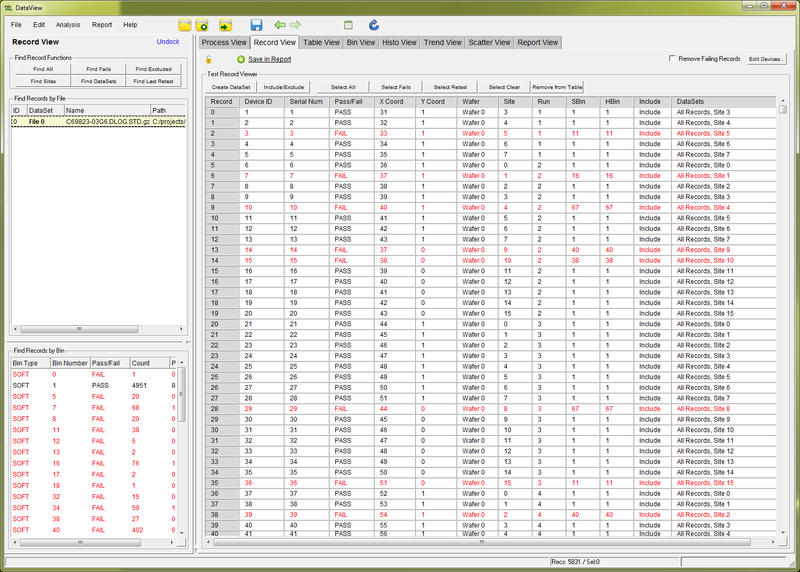 Bin Paretos by Site – Look at soft bins, hard bins, first failures, and test values in pareto form, across any DataSet. Zoom in on Bins – Double click any bin pareto to quickly jump to the corresponding set of records. 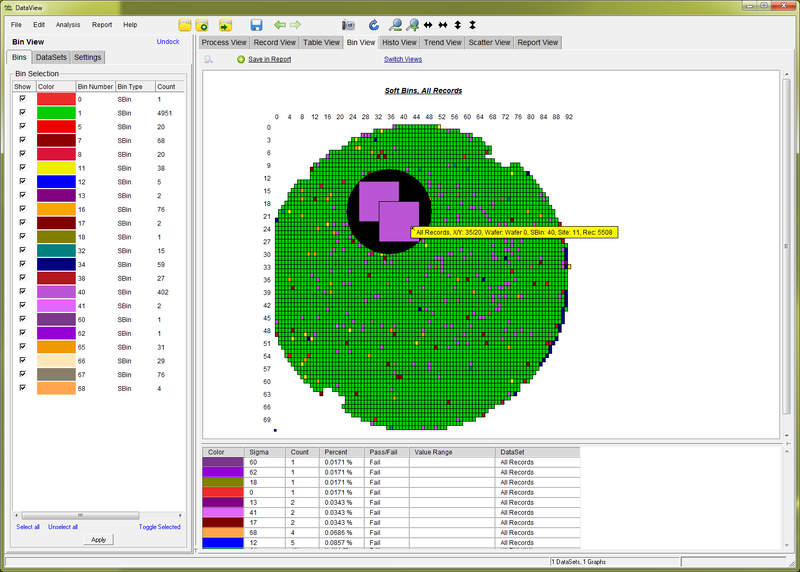 Lot Map of Soft Bins – View binning, failures, and test values relative to site testing. 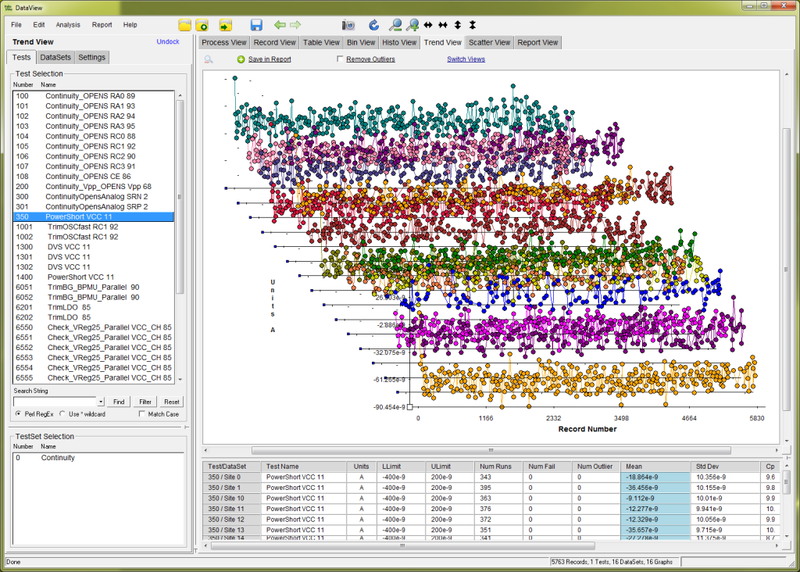 Lot Map showing Variance from Mean – The color gradient represents distance, in standard deviations, from the mean. 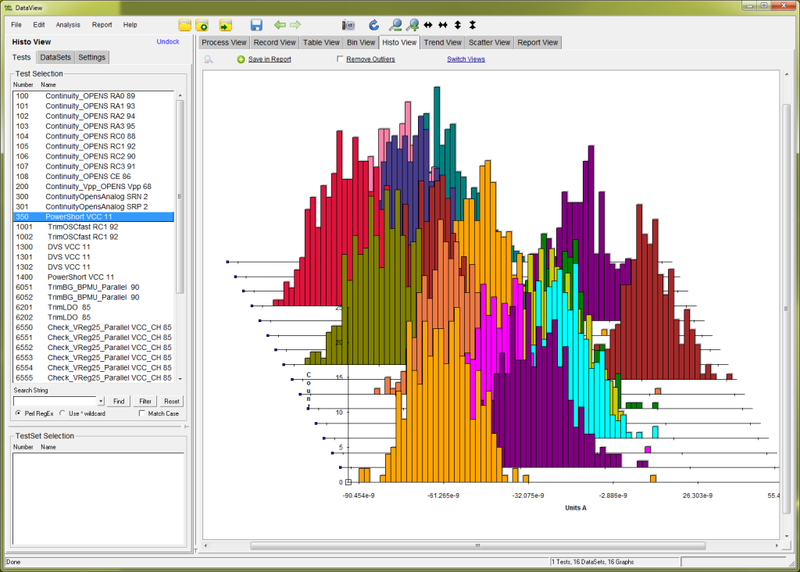 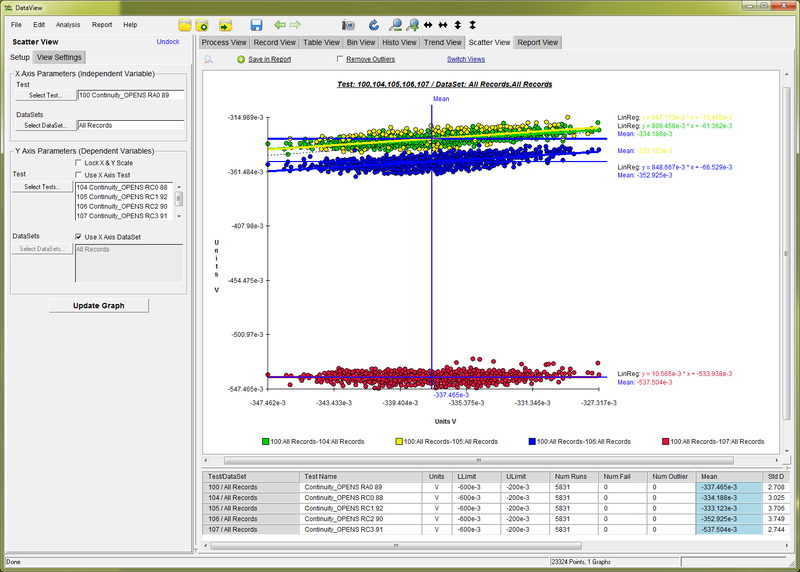 Adjacent Histogram Graph Style – Four sites are shown, each histogram bin has four different colored rectangles representing each of the sites. 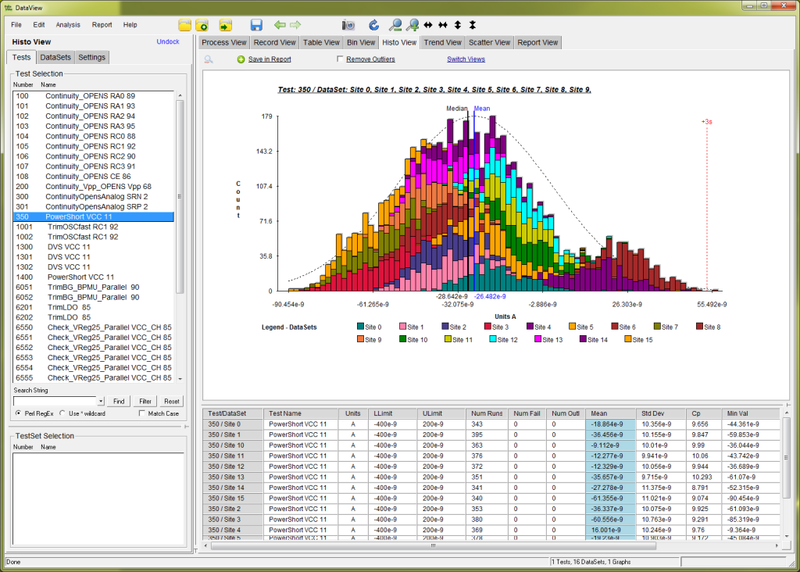 Stacked Histogram Graph Style – Each histogram bin contains a different colored rectangle stacked, one for each of 16 sites shown. 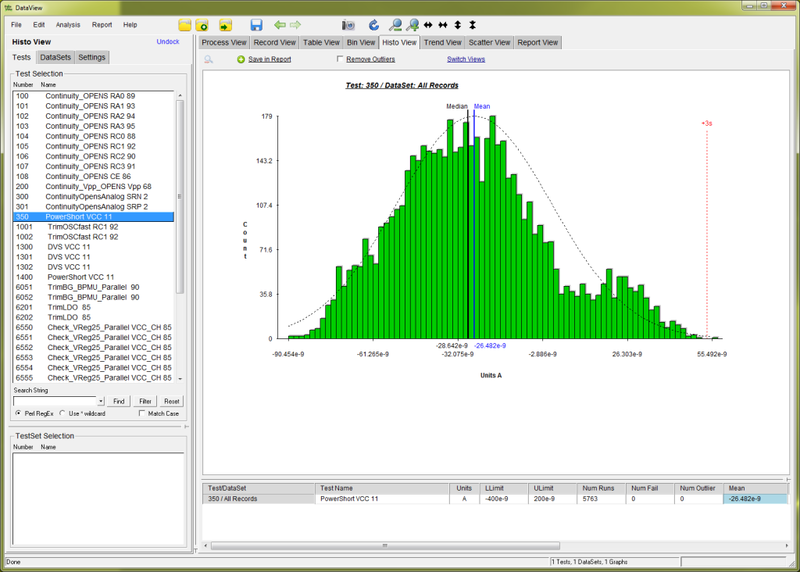 Histogram and Stats Table – A single test displaying the default “All Records” DataSet with no outliers removed. 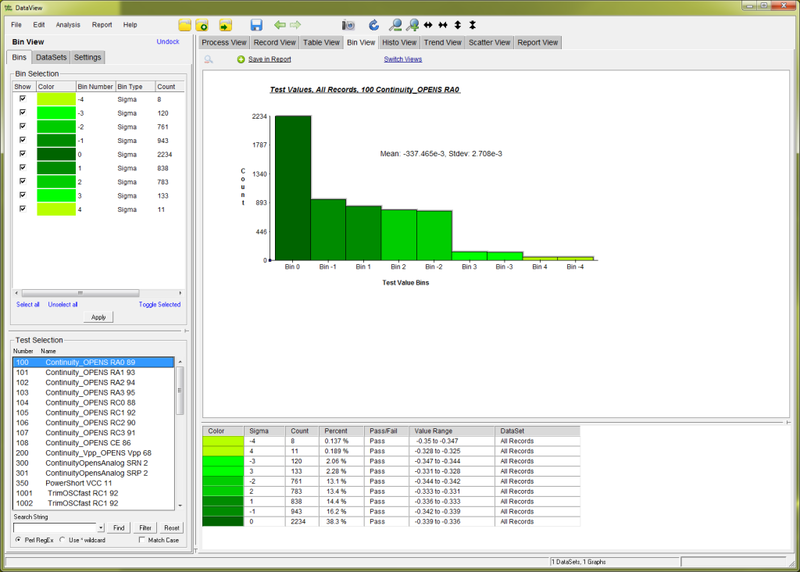 Individual Histogram Graph Style – Display a histogram for each selected DataSet across multiple tests, shown in a “Tile x 2” layout. 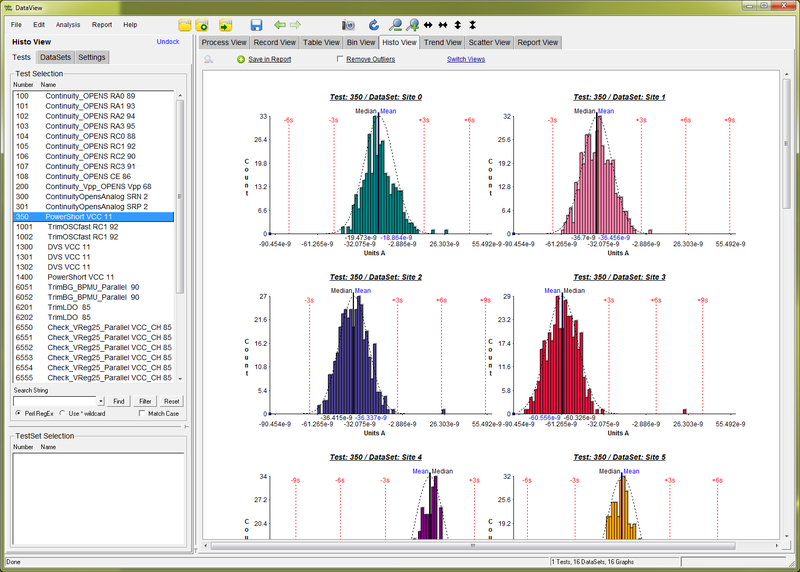 Individual Histograms with Overlay Layout – Multiple individual DataSet histograms displayed using the Overlay setting. HistoView with CDF and Boxplots – Histograms are disabled and CDF (Cumulative Density Function) curves and boxplots are enabled. 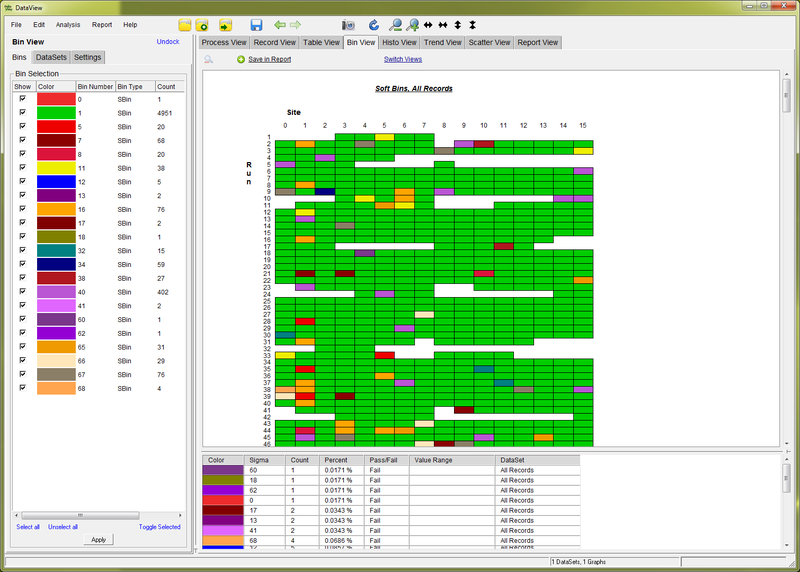 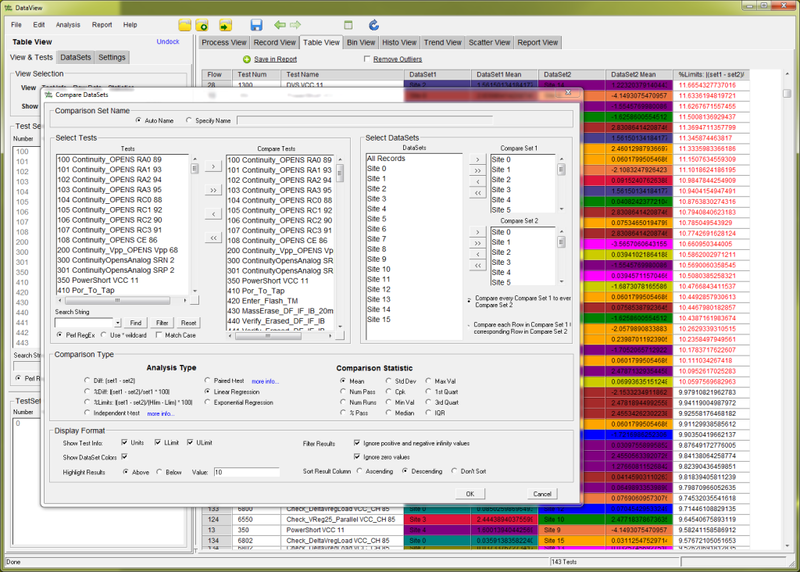 HistoView displaying Multiple Tests – Select and display multiple tests at the same time in HistoView. 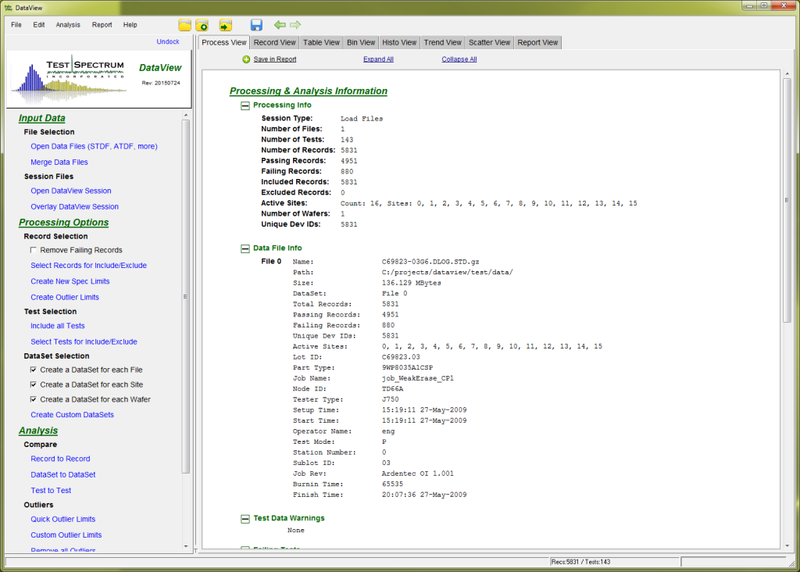 ProcessView – View and configure high-level data file processing information. 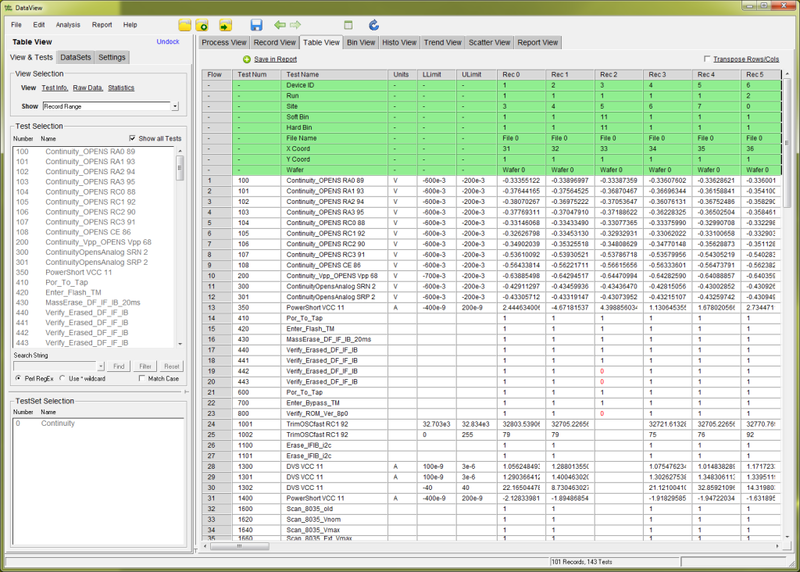 RecordView – Select and edit records by file, bin, site, DataSet and more using RecordView. 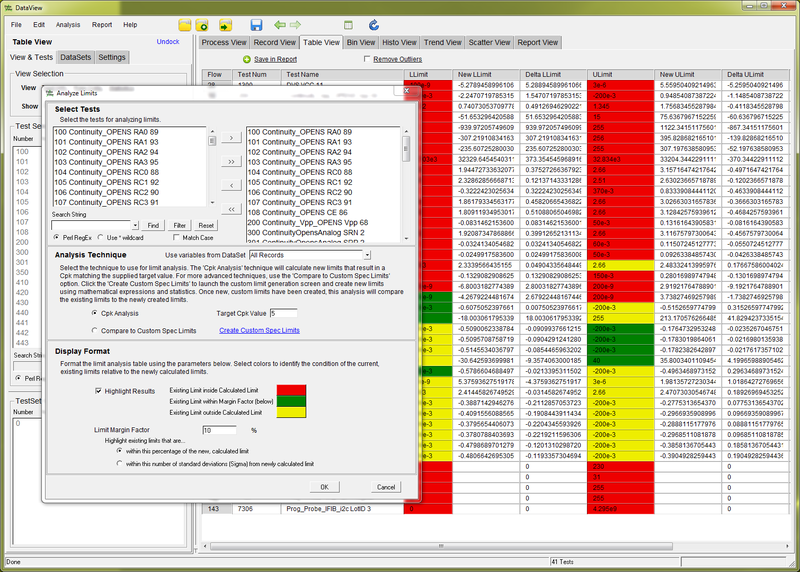 RecordView Excluded Devices – Remove device records from all processing and analysis in RecordView. 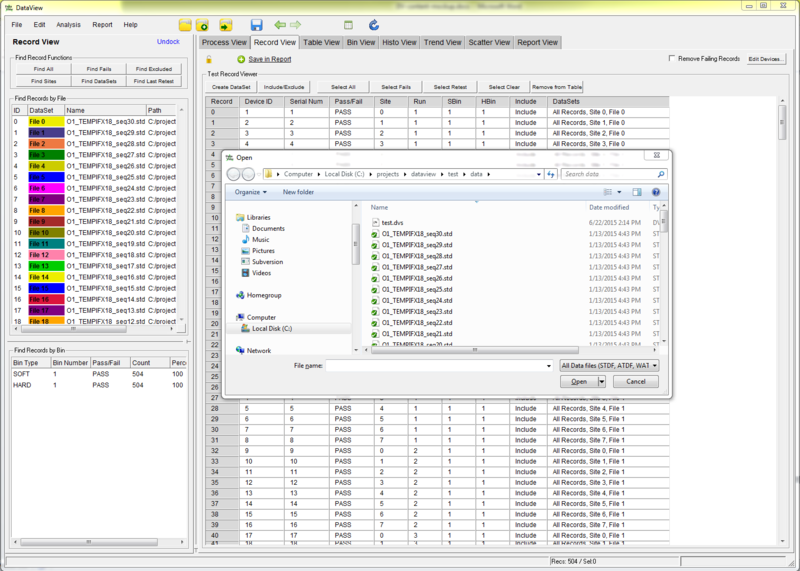 Merge multiple Files of Different Types – Select and open new files at any time of any format and merge with the existing records. 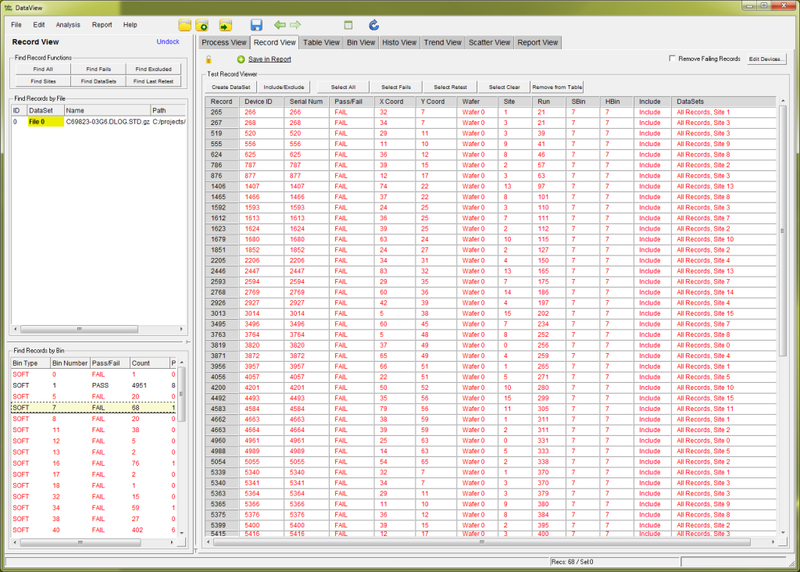 RecordView display Records by Bin – Select a bin and immediately have access to all test records from that bin. 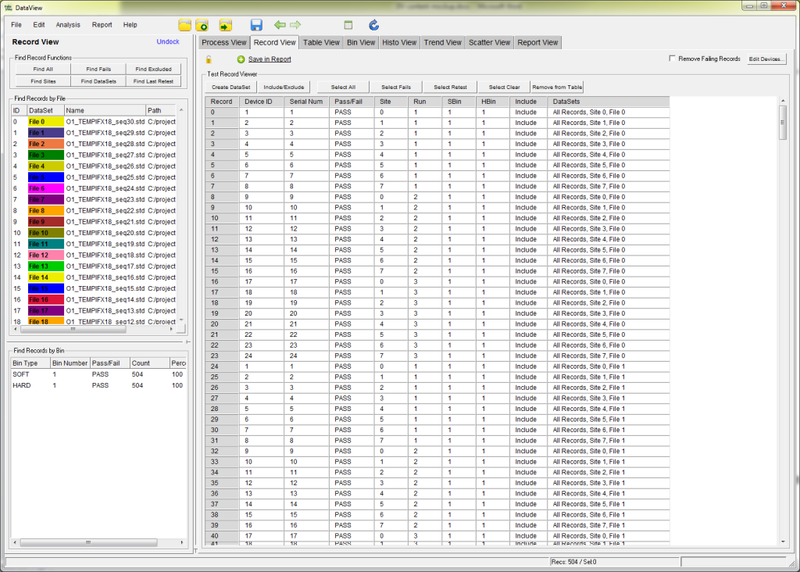 RecordView and Multiple Files – Manage your data records by file using RecordView. Report Builder in ReportView– Select the report type, tests of interest, and types of charts and graphs and quickly build your custom report using Report Builder. 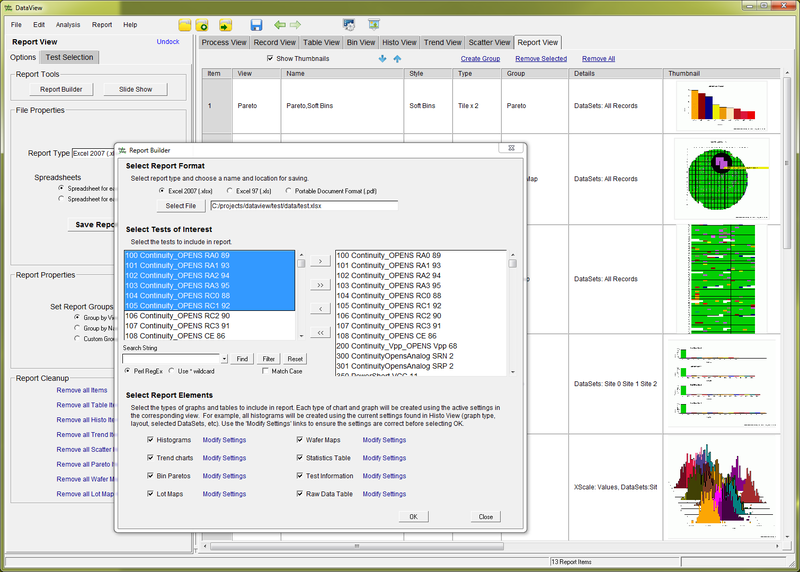 ReportView with Report Items – Double-click on a Report Item in ReportView to quickly return to the view and settings for that item. Individual Graph Style in ScatterView – Display instances of the dependent variable to many different independent variables. 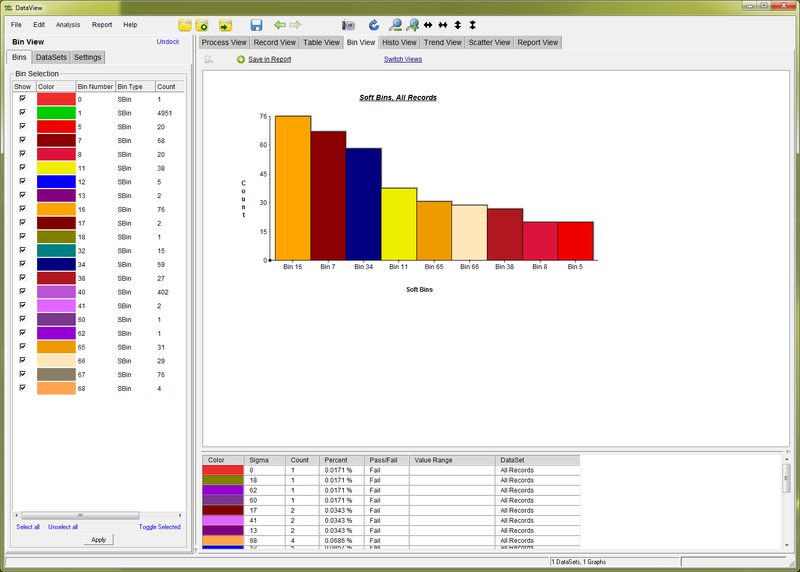 Stacked Graph Style in ScatternView – Show multiple instances of the dependent to different independent variables on the same graph. Zoom in to Values ScatternView – Set the graph X and Y axes to zoom to the min and max values for each dependent and independent variable. 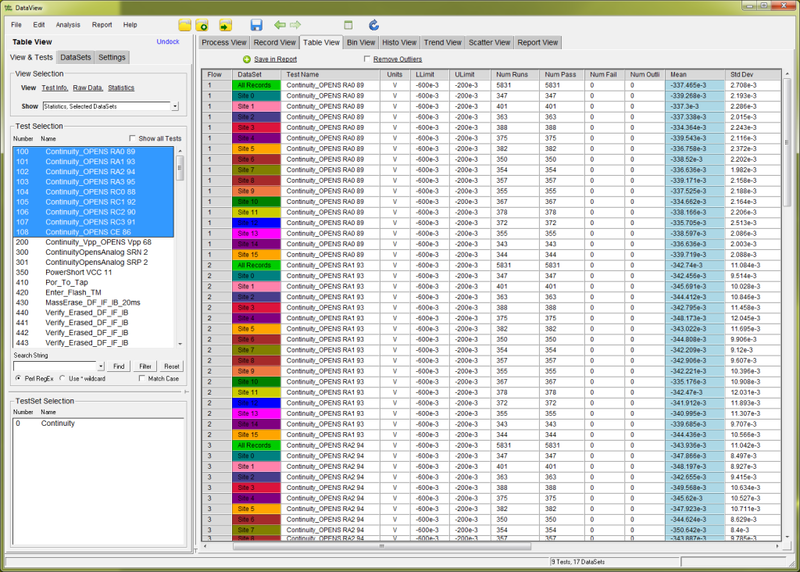 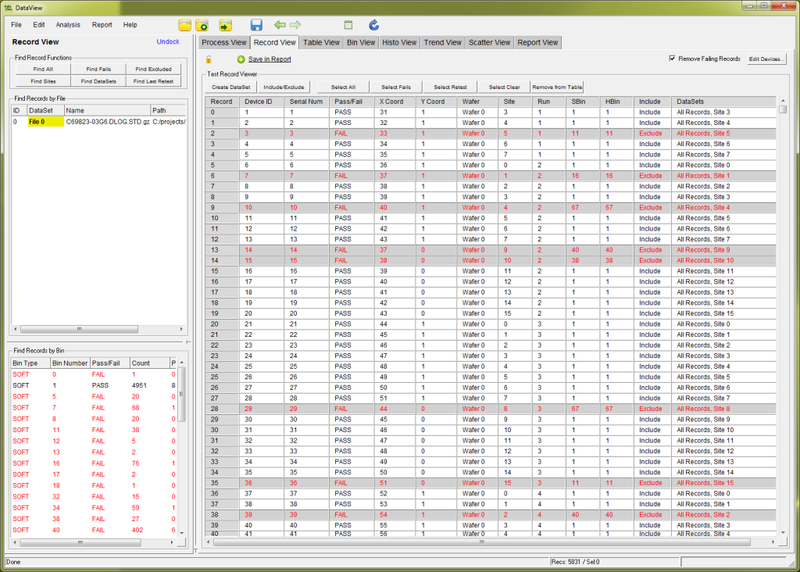 ScatterView with Stats Table – look at all stats on every view using the optional Table setting. 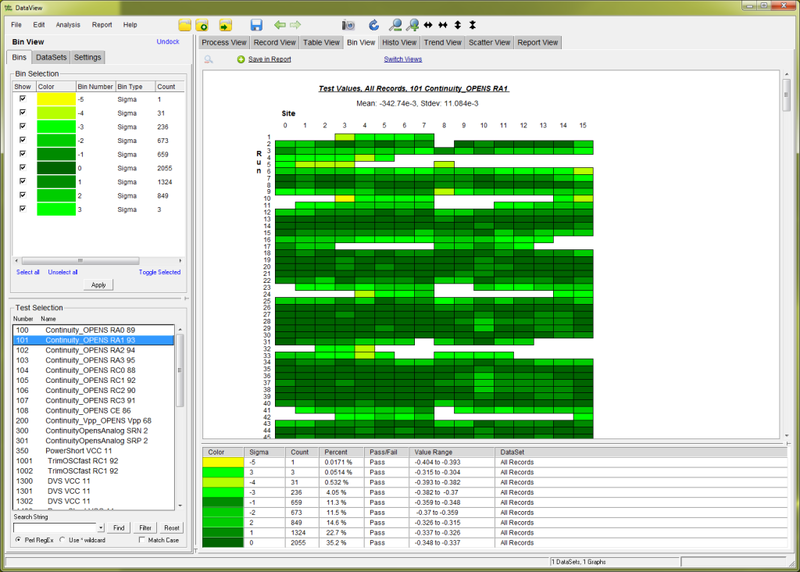 Statistics View in TableView – Customize the selection of statistics and view across any combination of records and devices. 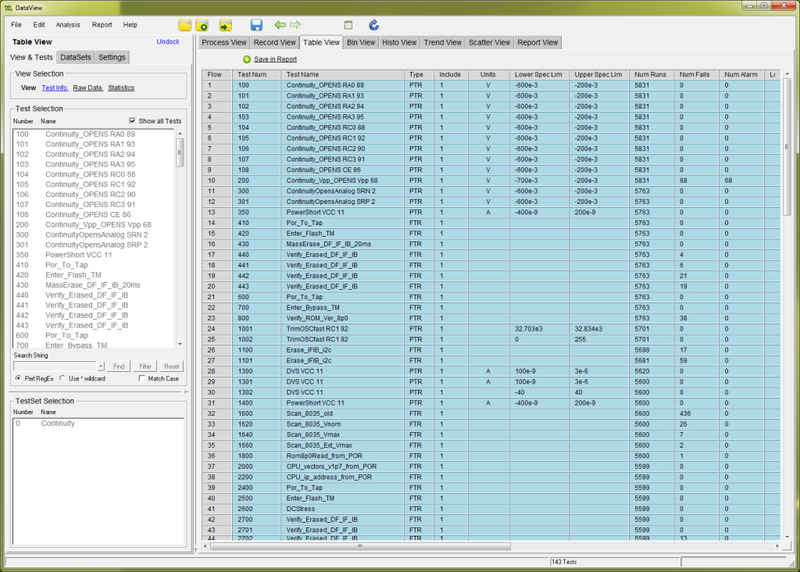 Raw Data Record in TableView – Quickly jump to any record or set of records and view the actual test data in TableView. Test View in TableView – View all test information such as test number, name, type, limits, and more using the Test View in TableView. 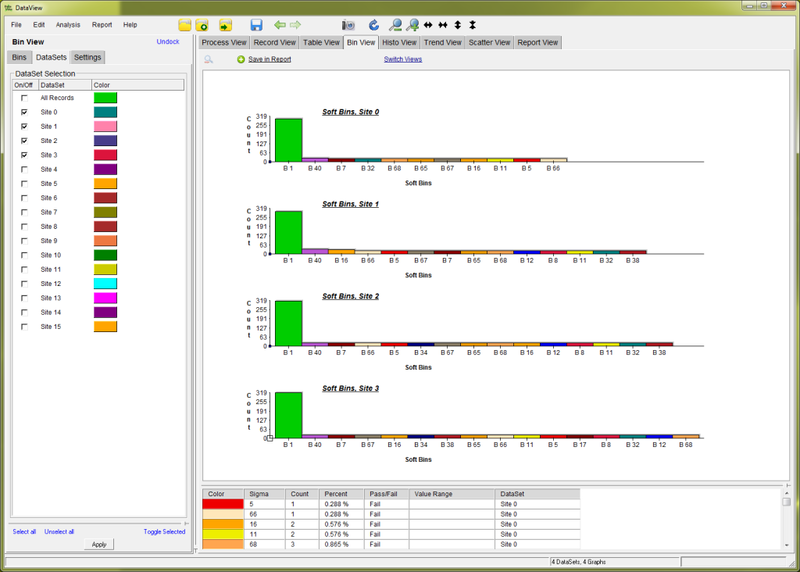 Multiple Tests in TrendView – Select and view several tests at the same time in TrendView. 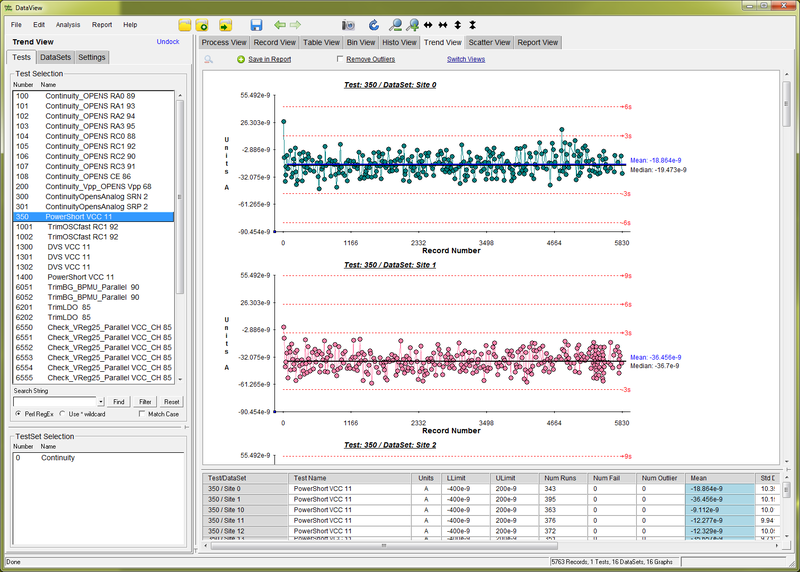 Individual Graph Style in TrendView – Select from many different layout styles and view multiple DataSets and tests using TrendView. 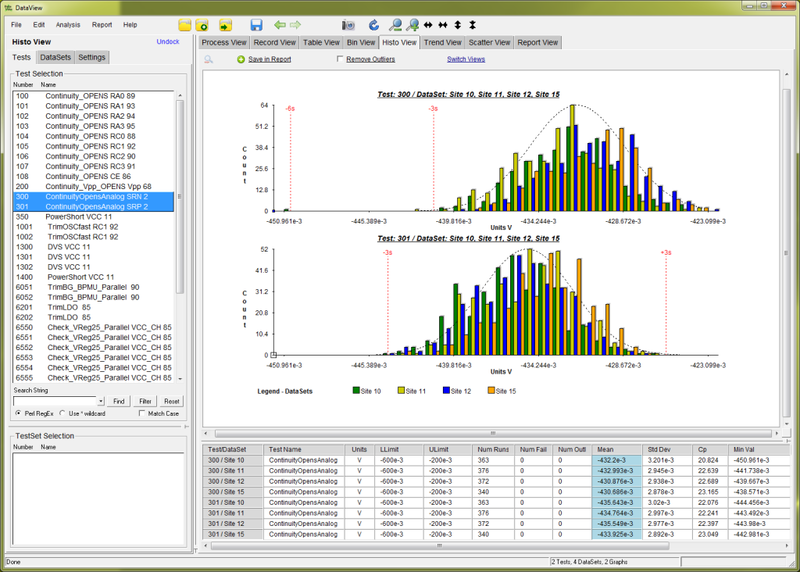 Stacked Graph Style in TrendView – Overlay multiple trend charts using stacked mode in TrendView. 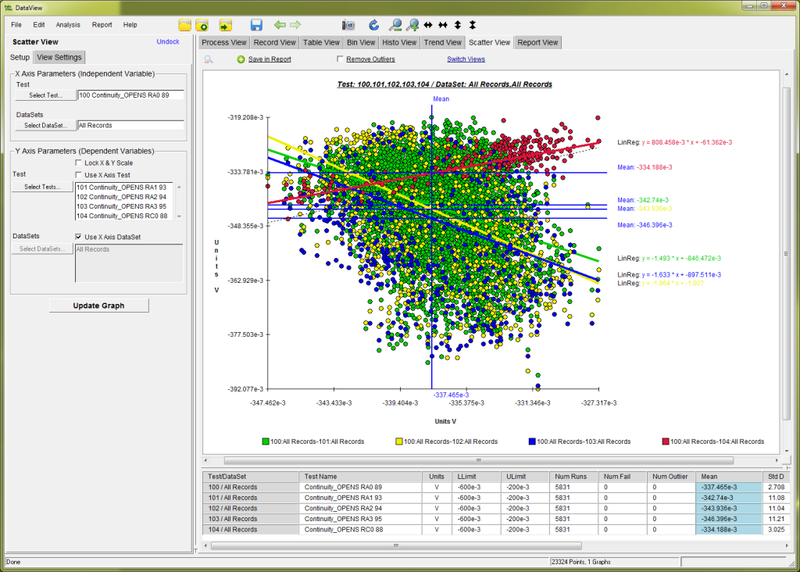 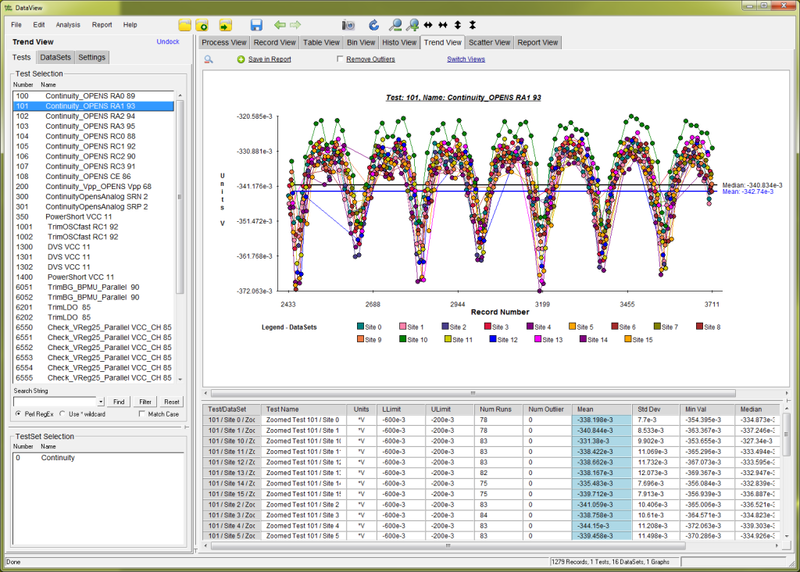 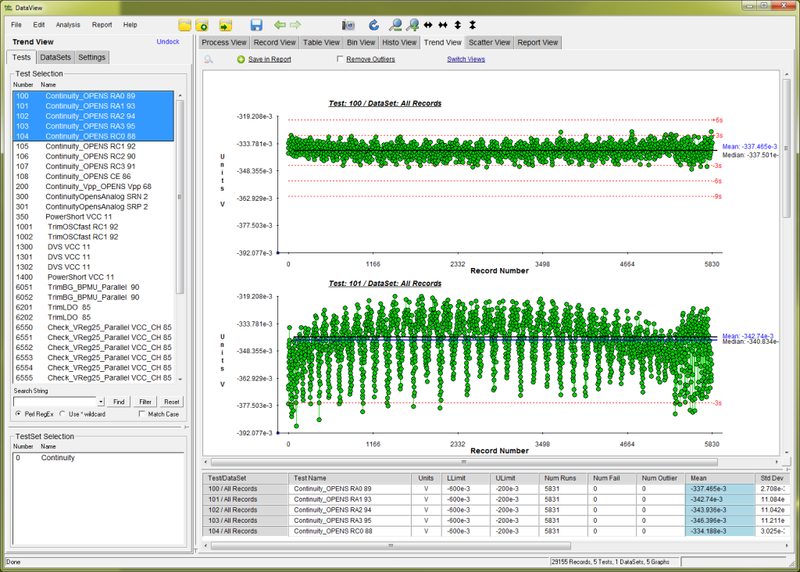 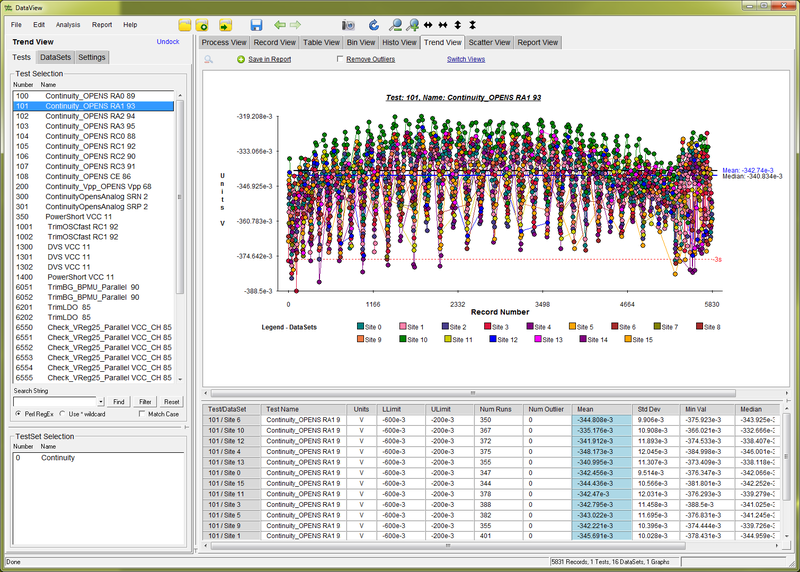 Individual Graph Style with Overlay in TrendView – Select several DataSets or tests and overlay the results for detailed comparisons. 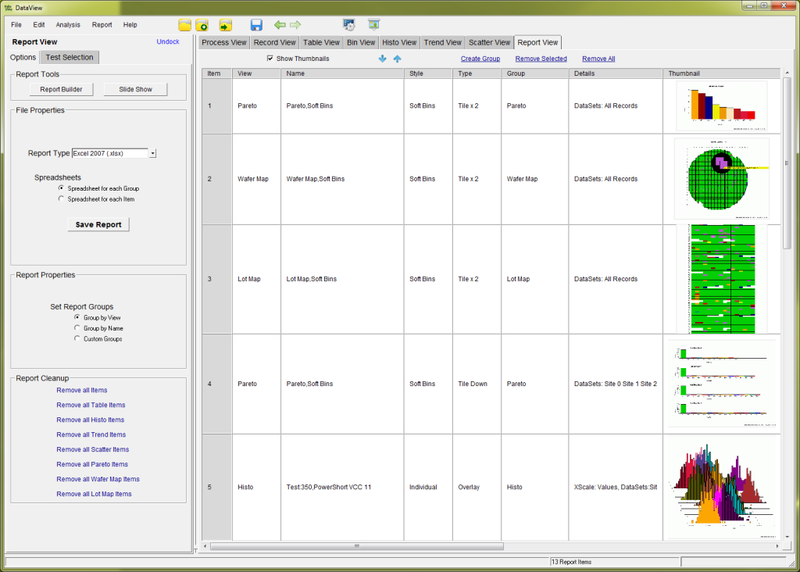 Trend View with 16 Sites Stacked – View multiple Sites at one time with TrendView stacked graph setting. 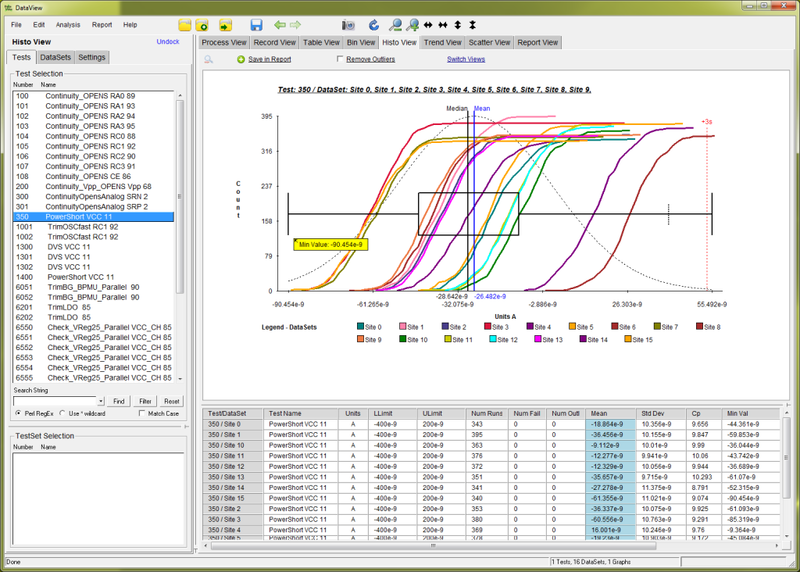 Zoomed In View in TrendView – Drag/drop and select any subset of any trend chart using TrendView.